See also the AEPM Flickr photo album devoted to the AMI ici. 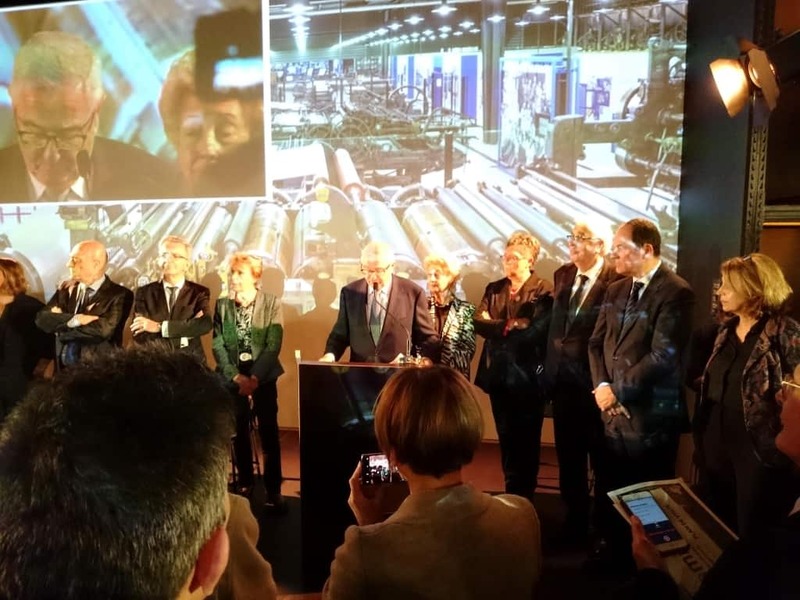 September 28 saw the arrival of a major new actor on the European printing museum scene with the opening of the Atelier-Musée Imprimerie (AMI) at Malesherbes, 70 kilometres South of Paris. 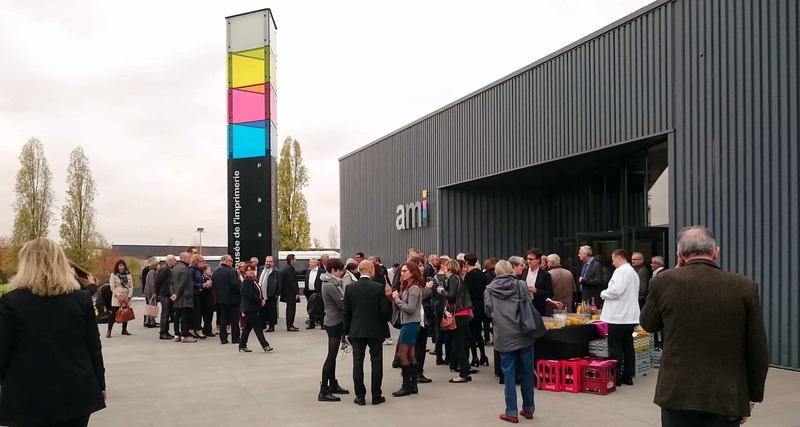 The AMI is the brainchild of Jean-Paul and Chantal Maury, and offers 5,000 m2 of exhibition space including workshops where visitors can make paper or learn the arts and crafts of paper marbling, type composition, printing and bookbinding. The 700 objects on display include 150 machines selected from the 300 which the Museum currently owns..
View of the main exhibition space. Such figures would be unexceptional if we were talking about a fine art museum, or a museum of natural history or science and technology. But they are quite exceptional for a printing museum. And, as it happens, they are just as exceptional as the Musée-Atelier Imprimerie itself, which is remarkable from whatever angle you care to look at it: its size and the extent of its collections; the quality of the exhibition design and the educational activities which it offers; or its location far from the more usual urban cultural centres where printing heritage tends to accumulate and be exhibited; and above all its determination to cover the history of printing up to and including the present day. The Atelier-Musée Imprimerie is also unusual because it was created by the founder and CEO of one of France’s biggest industrial printing groups, Jean-Paul Maury, with the active complicity of his wife Chantal. Jean-Paul Maury comes from a family of printers which has been active in the town of Millau in the Aveyron region of France since 1850, and whose current incarnation, based in Malesherbes, has for many years figured amongst the principal French printing groups with seven production sites and 1,300 employees. The flourishing industrial activity of Maury Imprimeurs has allowed Jean-Paul and Chantal Maury to devote a not inconsiderable budget to their dream of establishing a printing museum – a project which they have been promoting, sometimes against all odds, for over fifteen years. The creation of a museum of this size is no mean task at any time, whatever the circumstances. In the case of Jean-Paul Maury, his experience at the head of a major French – European even – printing firm doubtless provided him with the experience and the mettle to succeed. But if he was well-armed to deal with the endless technical and logistic complexities of such a project, he may well have wondered sometimes if he would succeed in the face of long periods of institutional indifference due to the vagaries of local and national politics. In the end however, the institutions rallied to what proved to be an unstoppable project! Guests arriving for the inauguration. So it was that the Atelier-Musée Imprimerie was officially inaugurated on the 24th October, a month after it opened its doors to the public, in the presence of over 800 guests who had made the journey to Malesherbes from all over France and beyond to be present at such an exceptional event: printers, publishers, graphic designers, printing historians, museums specialists, local and national political representatives, collectors, and friends and collaborators from the Loiret region. At a time when the irruption of digital technologies obliges us to reconsider the future contribution of printing to the progress of civilisation and democracy, and to reevaluate our understanding of its links with digital media, the opening of the Atelier-Musée Imprimerie represents a major contribution to the field of graphic heritage. 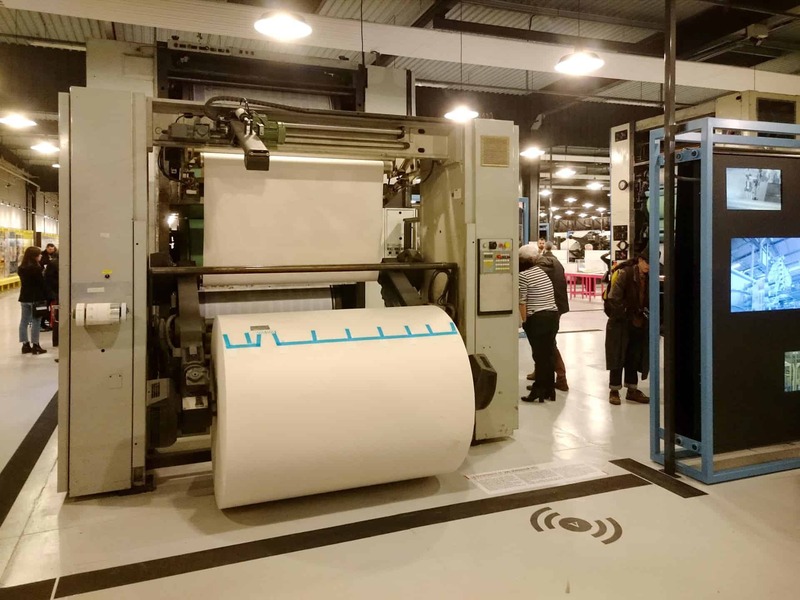 The Atelier-Musée Imprimerie offers a panorama of how printing and printed products have evolved over the centuries, from Gutenberg’s time through the Enlightenment, the Industrial Revolution, until the appearance of photographic processes, electronics and the digital revolution. The themes which are dealt with in the different sections of the exhibition often underline the continuities which run through the history graphic communication and the pertinence of printing history in the digital age with titles such as: the first media; the triumph of the written word; the arts and crafts of printing; the world as graphosphere. 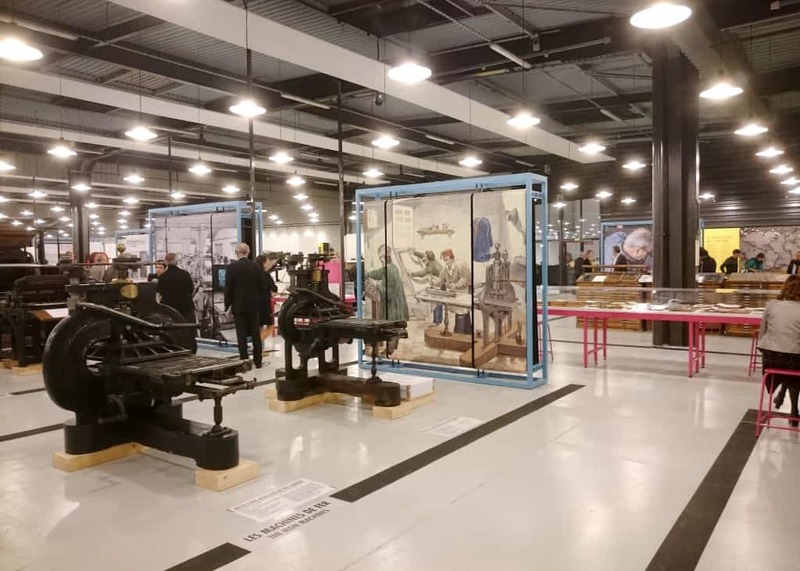 Likewise, by exhibiting side by side machines and printed products, films and audiovisual displays, and even a digital printing workshop, the Atelier-Musée Imprimerie situates the technical advances which have marked printing within the context of an ever-changing society. Sections devoted to book publishing, the press, engraving and illustration, photomechanical processes and colour printing, and the importance of print as the first mass media ensure that we never lose sight of the key rôle which printing played in the circulation of ideas and the spread of knowledge over a period of several centuries, despite more recent challenges from audiobvisual and, more recently, digital media. The AMI is undoubtedly strongest when dealing with the industrial period and one of its originalities is the importance which it places on the period since the Second World War and the recent appearance of digital technologies. It is surprising enough to find several large rotary presses displayed beside more classic machines (some quite rare) from the 19th and early 20th centuries. Even more surprising are many of the items from the very recent past of printing: machines which have been almost completely lost despite the fact that they were in operation only two generations ago: the French-built Lumitype 550, for example which was in use in the 1960s. It is also worth noting that most of the machines have been thoroughtly restored and many can be run for demonstrations. 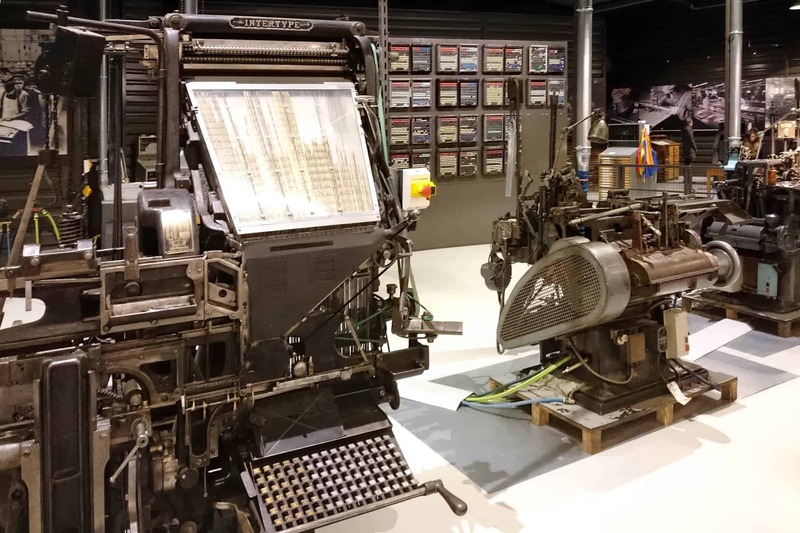 In recent times media historians – no doubt somewhat dazzled by the extraordinarily rapid development of audiovisual and digital media – have often tended to look upon the history of printing as a closed chapter in the history of communication. An important chapter of course, but one which is essentially disconnected from the emergence of digital media. A major error on their part, for today we are more than ever living in what one of the sections the Atelier-Musée Imprimerie calls the graphosphère, an environment in which graphic communication is onmipresent; an environment in which the forms and uses of text- and image-based media are inextricably linked and are in constant interaction. And just as the evolution of the technologies and social uses of the co-called old and new media media have become complimentary, so it has become vitally important to adopt a global approach to the history of graphic communication. The Atelier-Musée Imprimerie offers us a timely reminder that the history of printing did not stop with the end of hot metal! Fermeture le : 25 décembre, 1er janvier et 1er mai. Audioguides gratuit en français et en anglais.